Yeah! Another popsicle recipe! This is like the fourth popsicle recipes which I have tried in the last 2 months or so. (Note to self - That reminds me of something. I have yet to put up the recipe on my Nutella Banana Fudgesicles.) How can any one say no to a yummy creamy popsicle like this. It is the Oreo Cookies and Cream Popsicles! I kind of fancy the addition of the milk & whipping cream to the recipe as it really enhanced the taste of the creaminess in these popsicles. While these popsicles were freezing in the freezer, I was sitting impatiently in front of my television. Can't wait! 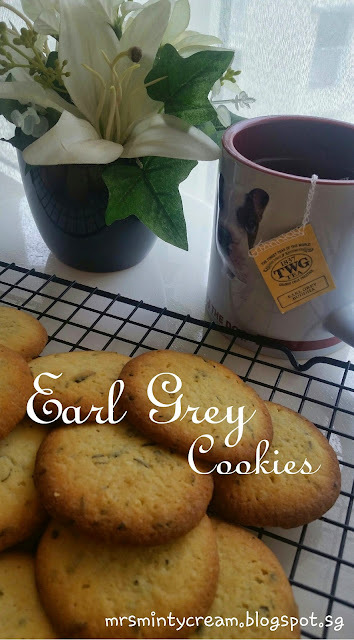 I could hardly wait for them to be ready so that I can have a taste of this creamy delightfulness. I am sure you understand what I mean, don't you? 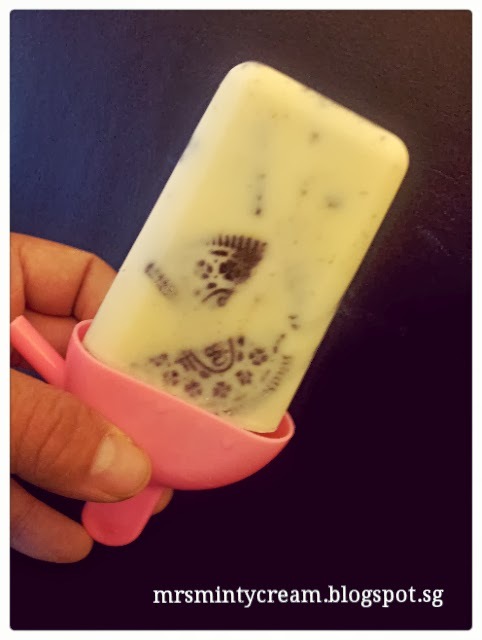 If you are not a great fan of dairy products, you may find this popsicle a little too milky on your first few bites. But, hold on to that thought! Wait till you bite into the soft and chocolatey Oreo Biscuits! It is so soft, creamy and sweet! Unbelievable! 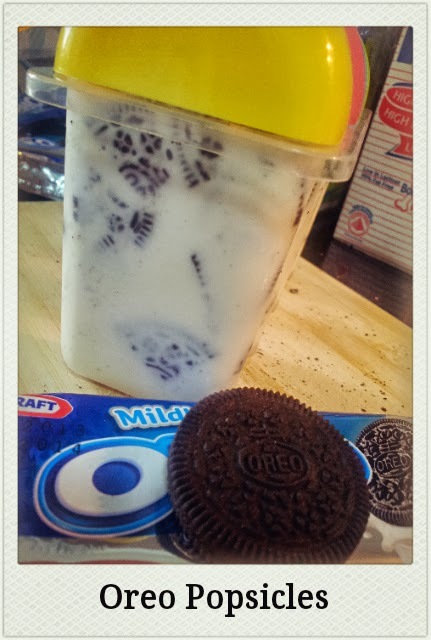 Once you have tasted that, you will understand how the milky cream part comes into play. It is totally a match made in popsicles heaven! Look at me! 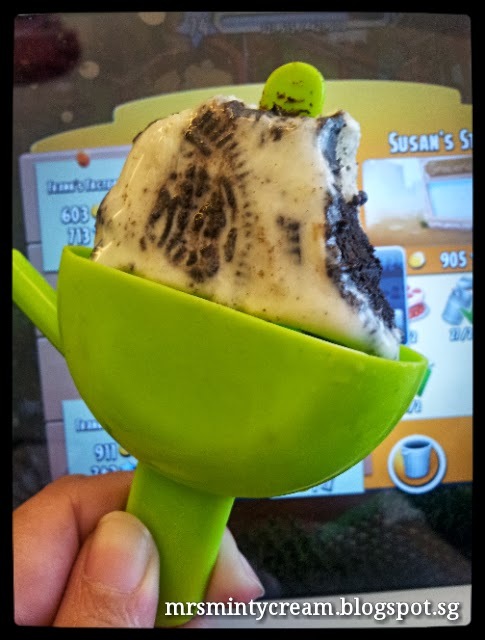 I was enjoying my yummy Oreo Popsicle while playing my favourite game, Hay Day, on my iPad. This is total enjoyment, I tell you. 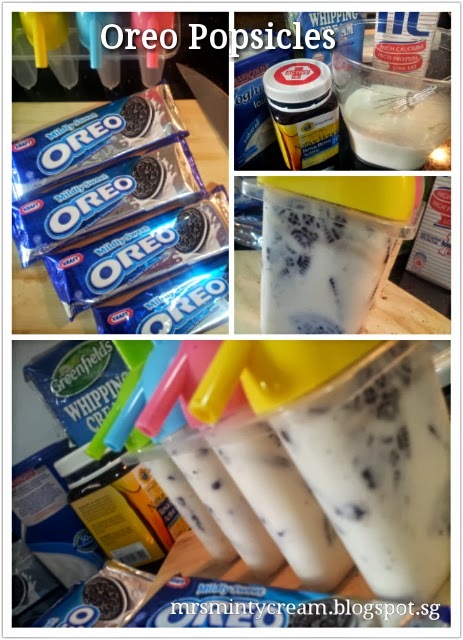 For those friends of mine who have been infected with my recent craze with Popsicles, go try this recipe out! You will not be disappointed, that I am sure! 1. Combine the whipping cream, milk, yogurt and honey in a liquid measuring cup. Whisk the mixture well to ensure that the honey is fully dissolved into the cream. 2. 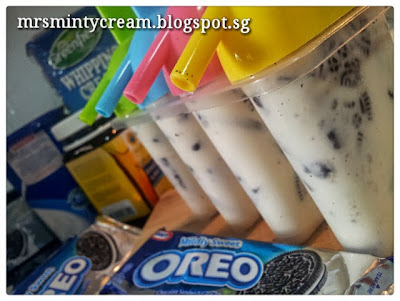 Slice each Oreo cookies into 4 pieces (quarters) and distribute the cookies among the popsicles moulds (8 quarters in each mould). 4. When removing popsicles from moulds, place the moulds under running water. This will ensure that the popsicles come out smoothly from the moulds.